Continuing in our tough topics series, today and tomorrow, we’ll be tackling self-care. And along with that, we’re giving away two of my favorite books on serving God with our whole selves. Read to the bottom of this post to enter for a chance to win Tim Challies’ excellent little book Do More Better: A Practical Guide to Productivity, and stick around for another giveaway tomorrow. Now for today’s post . . . Girl, you can’t afford not to treat yourself. Everyone seems to have an opinion on the topic of self-care. As women of God, we have to think carefully about the conversations that are happening around us, both for our own lives and to be able to speak hope into the lives of others. On the True Woman blog this month, we’ve been talking about tackling tough topics—and this requires discernment. As Hebrews 5:14 reminds us, discernment takes practice. So, as those who seek to become mature, let’s do it. Let’s train our powers of discernment by digging into what Scripture says about self-care. 1. You are a whole person, not just a soul. If like me, you have attended churches that emphasize the spiritual disciplines but view other aspects of life that often factor into today’s concept of “self-care”—such as making time for rest, pursuing physical health, enjoying the arts, or celebrating His gifts in the natural world—as not worthy of our attention or time, this is an important truth. We can easily forget that our bodies, hearts, and minds are important parts of who we are as human beings. But unlike the Gnostics and their modern-day dopplegangers, who teach that the physical body is evil and spiritual knowledge is all that matters, Scripture paints a different picture. It teaches that God designed us as multifaceted, with a body, mind, spirit, heart, and soul that make up our whole being—and that all of those parts of us are made to love and serve Him (Mark 12:30; 1 Thess. 5:23). 2. Stewardship is an act of worship. Did you catch it? What did Paul invite us to present to God as a sacrifice? Our bodies! Presenting our bodies (not just our souls) to God is spiritual worship. How? God’s Word tells us to exercise self-control by disciplining our bodies (1 Cor. 9:25–27) and that caring for our physical bodies is useful (1 Tim. 4:8; 5:23), but also that physical care or discipline doesn’t take care of our hearts’ sin problem (1 Tim. 4:8; Col. 2:23). What does this mean practically? It means valuing drinking water while still running to Christ for living water, eating healthy food and also letting Jesus feed and nourish your soul, and enjoying walks for exercise while also attending to your walk in the Spirit. 3. As a human, you are finite, with limits. God made us as finite bearers of His image (Ps. 103:15–16; Gen. 1:27). That means that though we reflect some aspects of who God is, we’re not infinite or limitless. Instead, we’re weak. We have limits. We need rest. We are dependent on Him as little children. And most of the time, He calls us to serve within those limits. Do we call these boundaries good and “pleasant” (Ps. 16:6), or do we go-go-go in the name of Jesus without stopping? Do we pause and remember that in our limited humanity we’re not God? Here’s the truth: We can’t do it all. But take heart! We can trust our sovereign, good, and strong God who can do it all. He gives us grace to work hard and handles the rest when our fuel and effort runs out. 4. Limits are an opportunity. Several years ago, I taught music composition to high schoolers. Many of these aspiring young Mozarts were very creative—and overly ambitious. I’d give an assignment, and they would put together a mini-orchestra. I’d tell them to write a piece, and they’d write three movements (which was basically three pieces). They managed to impress me with their ambition, but often they would forget the basic fundamentals in their efforts to do something great and grand. As a young teacher, I quickly learned the importance of giving my students boundaries so they could practice the basics and stretch their ability to create something beautiful within limits. They often fought me on this, but their future musical creations ended up much stronger as a result. I see this thread throughout Scripture, too. Like a kind teacher, God gives His servants boundaries within which to creatively serve Him and others. We get tired. We get emotionally frayed. We get hungry. And He invites us to do what we can and then rest and care for those needs. And behold, an angel touched him and said to him, “Arise and eat.” And he looked, and behold, there was at his head a cake baked on hot stones and a jar of water. And he ate and drank and lay down again. And the angel of the LORD came again a second time and touched him and said, “Arise and eat, for the journey is too great for you.” And he arose and ate and drank, and went in the strength of that food forty days and forty nights to Horeb, the mount of God (1 Kings 19:5–8, emphasis added). Elijah’s season of extraordinary service had left him neglecting the basics of life—resting, drinking water, and eating. So, God kindly brought Elijah to a place where he could be cared for. He let him sleep, fed him, and gave him water to drink. Then Elijah was able to get up again and serve the Lord in full strength. God may not send an angel to provide cake for you, but notice the personal care He shows for Elijah. It teaches us about His heart for our humanity and that ordinarily taking time to care for these essential things is not wrong. Rather caring for ourselves in appropriate ways, within our limits, strengthens us for when we’re stretched in creative and tiring ways. Perhaps you read this and say, “But you don’t understand! 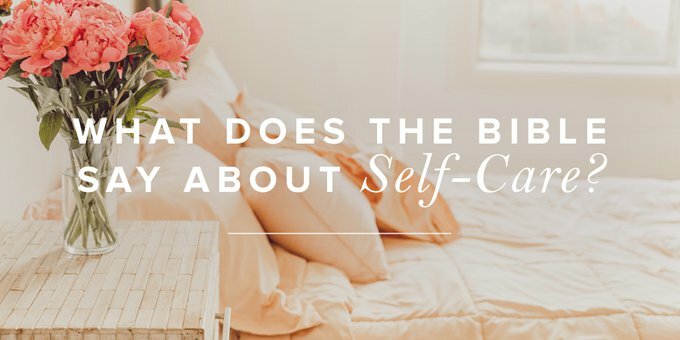 I can’t possibly take time to rest.” You may be juggling a lot of hats as a mom or caring for elderly parents or working a difficult job or two that leaves you little time to “self-care.” If that’s you, the cultural conversation about “self-care” may cause you guilt, anger, or frustration. (Or all of the above.) Let me encourage you: Just like Elijah, you’re in a season of extraordinary service—and in most cases, it is a season. God sees you in your sacrifices, and He offers hope for you. Psalm 1:3 reminds us that righteous people, like trees by a river, yield fruit in the appropriate seasons, because they are continually watered by the Word of God. And Psalm 23 talks about different seasons—the ones of peace and “green pastures” and the ones in “the valley of the shadow of death.” Our Good Shepherd cares for His sheep in both places, and He provides rest at the time that is best for us. So, if you are in more of a dark valley season where you have to set aside some of your needs, don’t lose heart. The Lord sees, and He knows. Lean into the strength He has given you in seasons of rest, and give thanks for the small moments you can take to let Him care for you, even if it’s just five seconds of a deep breath and a prayer. There is a danger, though, for those of us not in an extraordinary season. Because of our world’s norm of hustle and weariness, we can take the extraordinary and establish it as the norm. We forget that life has seasons. Perhaps God’s call to us is to take time to “come away and rest” (Mark 6:31) and establish healthy rhythms of caring for ourselves, so when the time comes for us to be stretched beyond our limits as Elijah was, we’ll have reserves of strength to carry us through the wilderness. Tomorrow, we’ll cover the other five principles, and wrap it all up with some practical takeaways. But for now, what are your thoughts on the idea of “self-care”? Leave a comment below, and enter the giveaway for a chance to win Tim Challies’ book Do More Better.